It was mid November and drizzling all day in Bangalore . Were the Gods crying to see another God (Sachin Tendulkar) retiring ? Or maybe they shed tears because they don’t have such an option 😉 Well, whether or not they were crying, the effect was on the temperature. I cuddled up inside my blanket, feeling toasty, shuddering to think of how cold Bharatpur would be in two weeks’ time. Bharatpur wasn’t cold at all, by its own standards. We didn’t need our jackets, although it was early December. Trying out a couple of rides on the cycle rickshaws, we decided to walk around the Keoladeo Ghana National Park (read “Kevalaadev”). With all the walking, cold went out of my dictionary. Keoladeo Ghana National Park is an extremely picturesque place with different types of habitats. Towards afternoon, we walked towards the grassland area. The migratory birds were not in great numbers, maybe because it wasn’t cold enough. We thought of stopping for a brief fruit-break, to eat some Kinnow, a citrus fruit with a striking resemblance to orange fruit. Our guide hushed us and pointed to the bushes. There it was, one of the cutest looking rodents. We settled down a few meters away, taking care not to have any sudden movements, and watched the nibbler in action. It would pick a leaf, nibble, run back into the bush. It would come out almost immediately, pick another leaf and go karrum-kurrum on it. We “Whatsapp”ed a picture to a very knowledgeable friend, who instantly identified it as the Indian Bush Rat (Golunda ellioti). One of the papers referred to in the wiki mentions its Tamil name as Utu-elli. Sugandhi and I have been trying to find Kannada books referring to this rodent, and our search continues. Some books on Coorg coffee have referred to it as the Coffee Rat, a pest coffee-growers are wary of. Harriers (birds of prey) and snakes feed on the Indian Bush Rat. One of the studies carried out on the Jungle Cat, Caracal and the Golden Jackal indicates Golunda ellioti as their most important prey. The statistics: it forms 47% of total rodent intake in Jungle Cat, 40% in Caracal and 56% in Golden Jackal. These numbers show how important this little fellow is in the food chain, at least for all of these predators. 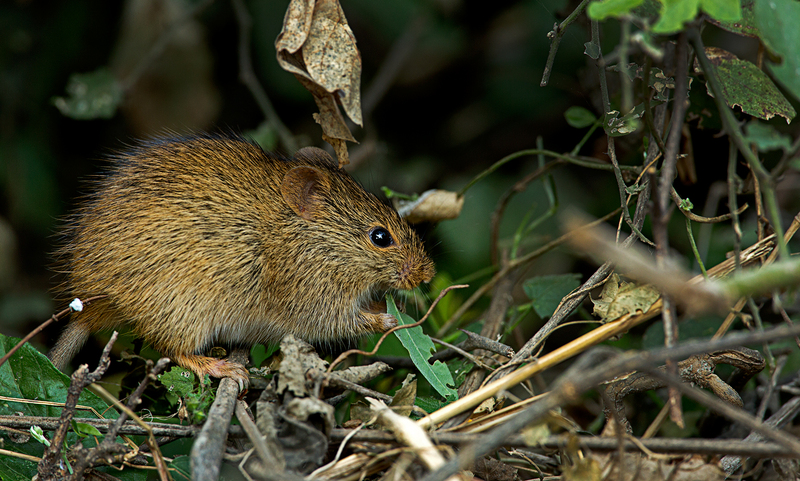 The Indian Bush Rat is widely distributed in India, the only existing member of its genus Golunda. Here’s an interesting note from an old report on coffee estates in Coorg. 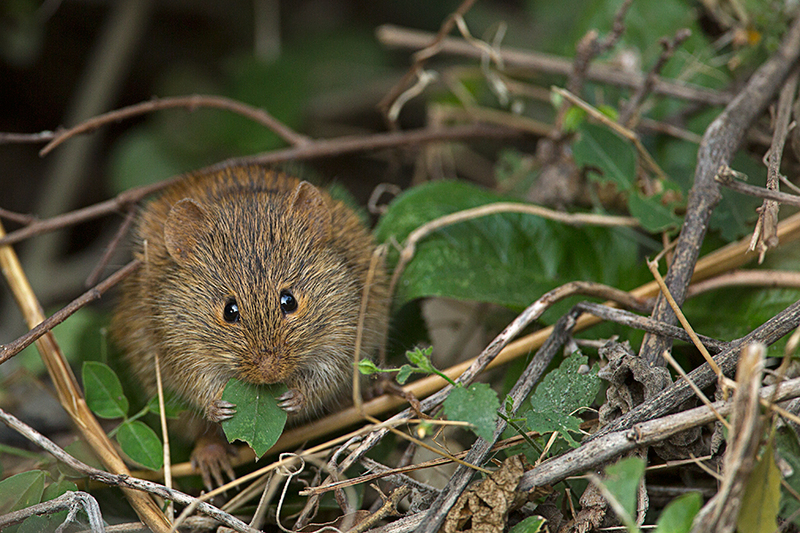 It says the Coffee Rat is seen in huge numbers in one season and sometimes disappears for years. The native people believe and attribute the cause to bamboo seeds! The rat feeds on bamboo seeds, apart from other plants. Now, bamboo flowers once in forty years or sixty years. With so much food available then, the rats are also available in plenty to feed on the seeds! When they finish consuming all of this food stock, they move on to other delicacies, like coffee.